I received two letters today, the kind with stamps on the front and everything; real mail delivered to my house by our mailman Butch who has hot legs and who wore shorts even on the coldest winter days because he made a bet with another mailman over who would chicken out first and put on pants. Anyway, not only did I get letters, but the senders sent pictures, too! Not links to Kodak or Snapfish or attached in an email, but real hold-‘em-in-my-hands pictures. The first letter was from my mom. She sent photos of their rearranged living room. Since they live so far away, it’s important to me that I visualize where Mom watches her soaps and where Dad naps before going to bed. Like Archie and Edith Bunker, they have their own chairs – identical La-Z-Boys that you wouldn’t be able to tell apart except for the popcorn hidden in the cloth folds between the foot and arm rests. That would be my dad’s chair. No one’s in the photos, but the furniture is like looking at family (not that my family physically resembles ready-to-assemble entertainment centers). Even though most of their furniture is new since I lived with them, it still has that Mom and Dad feel and I like seeing it from time to time. Sitting on end tables and the TV stand are photos of the grandkids and greatgrandkid, a few trinkets and knick knacks that Mom hasn’t passed on to the rest of us, and some candles and other familiar reminders of home. On the walls they’ve hung the scary drawing of Jesus my sister Emily sketched in high school, the painting of a crane my brother made in high school, another painting of my grandmother’s childhood home in Norway, and two handmade Norwegian tapestries. When my parents moved out of the big house and downsized, they kept the things that mattered to them the most and sold or gave away the rest. I love the little surprises I find in their townhome when I visit, those things they chose to keep. Nothing is wasting space. Everything there has a purpose or meaning. I can’t wait to see their new arrangement for myself when I visit them in August. For now, the photos will sustain me. The second letter with photographs was from my friend, Pam (happy birthday!). Pam is my age, albeit two months and seven days older, and has a 25-year-old (same as me), a 23-year-old (same as me) and a grandbaby (same as me). However, Pam also has a 5-year-old son named Jack, who was a BIG surprise for her and her husband back in 2002. Like my parents, I can’t wait to see that kid in August. Unrelated to real photos or mail, there’s a photo I’ve been wanting to share with you all but I never remember to post it until those 3 a.m. nights when I can’t sleep. 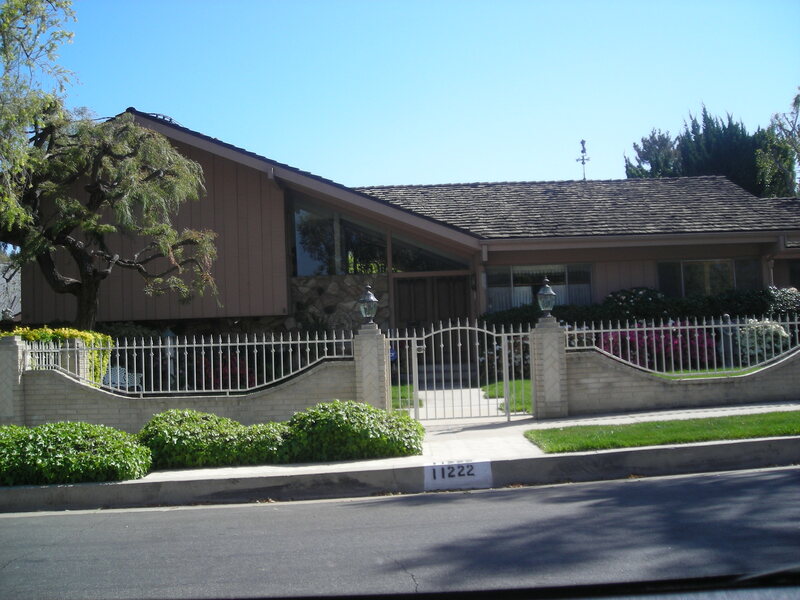 When I was in California, my sister drove Carlene and me past “The Brady Bunch” house. The show wasn’t filmed there, but it’s the house they used for pans of what they wanted us to believe was the actual house. I’m such a back-end baby boomer and I reacted like that house was a celebrity. I was like a 10-year-old taking photos of the place, thinking my nasty little pre-teen thoughts about Peter yet knowing I was Jan and never Marcia. A woman was bent over and weeding the front garden and I wanted to yell out, “Are you Alice?” But I didn’t. I just took my photo and got back in the car. This was a good day. Letters, photos, “The Brady Bunch”…just like the days of *gulp* old. This entry was posted in Uncategorized on June 6, 2008 by Lynn Haraldson. Correction, my dear sister, it is a PAINTING and I did it in college! My mom sends me real pictures in the mail. The latest ones I got were of the work she’s done in her yard. I need to send in some of my digital photos to be printed as I like pictures on real paper. I still write old fashioned letters and love stationary (and I have a lovely fountain pen for letter writing). I’m a dinosaur…. I love the fact that you’ve been kept up-to-date with the furniture. These details of family life are wonderful.